They're a happy team at Hawthorn, as they run out big 64 point winners over the Gold Coast Suns. Ablett finishes with 44 possessions in a best on ground performance. GOAL HAWKSSmith ducks and weaves, he decides to share it with Ellis, who kicks it along the ground for a goal. GOAL SUNSTaylor takes the chest mark 40m from goal on a 45 degree angle. He kicks his first career goal in AFL ranks. BEHIND HAWKSBirchall gives it to Breust who hands it off to Puopolo but he kicks it away to the right side of the goal post. The interesting thing about Hawthorn's performance is that they haven't really got out of first gear and yet they lead by 63 points. The question left for the game, is whether Gary Ablett can take it to 50 possessions for the game, he is still on 43 possessions at the moment, but he still has three and a half minutes left. GOAL HAWKSGunston marks on the wing, Caddy runs into the 5m protected zone and the umpire awards a 50m penalty. Gunston kicks from 34m and kicks his fourth. The margin is out to 57 points, but saying that the Gold Coast have been quiet good today. GOAL HAWKSHodge kicks for goal on the run, but Breust finishes it off for him. An update in the Hodge Vs Ablett clash: Ablett has had 43 possessions and two goals whilst Hodge has had 32 possessions and two behinds. GOAL HAWKSGunston runs with the fight of the ball and marks on the edge of the goal square. He kicks from 5m out directly in front and he kicks his third goal of the game. BEHIND HAWKSWarnock gives away the free kick to Savage for holding the right arm, he takes the kick for goal and can only manage a minor score. Play is held up momentarily as Guerra is down after copping a knee to the head. He looks to be okay as he gets back up to his feet. Poor play by Coad, who attempts to deliberately rush the ball through for a point, but the umpire awards the free kick to Puopolo who kicks it out on the full. GOAL HAWKSBirchall delivers it short to Lewis, who mark 45m from goal on a slight angle, he kicks truly and the Hawks are back out to a 44 point lead. BEHIND HAWKSSewell kicks for goal but it falls short to the top of the goal square, Ablett ends up rushing it through for a point. Hawthorn run it out of defence and have players everywhere, it seems only a matter of time before the Hawks score once again. GOAL SUNSAblett takes it on the wing, kicks it long and high inside 50 and Brown times it perfectly to mark 40m from goal directly in front. He kicks his second goal of the game. BEHIND HAWKSBreust marks 45m from goal on a slight angle, he starts it out right and it stays there. SUBSTITUTION SUNSToy is activated into the game as Shaw head off to the red vest. GOAL HAWKSBateman hands it off to Roughead who bounces it through for his second goal of the term. GOAL HAWKSWarnock goes over the shoulder on Roughead and gives away a free kick 20m from goal on a slight angle. He kicks it through for only his first goal of the afternoon. SUBSTITUTION HAWKSThe Hawks have subbed out Gilham and brought Bateman into the game, as the Hawks get the ball out of the centre. The Suns win the quarter by two points, however the Hawks still hold a 30 point lead at the final break. 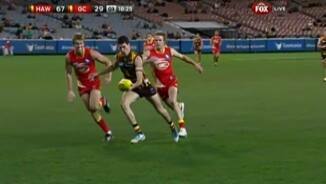 BEHIND HAWKSRoughead palms it down beautifully to Smith who misses his shot at goal. GOAL SUNSSchoenmakers gets into the back of May, 25m from goal on a slight angle. He slots it straight through for his third goal of the game. GOAL SUNSA great bump by Brown, as the ball spills to Magin, who puts it onto the boot and kicks his second goal of the game. 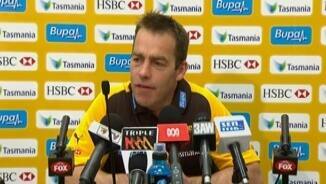 The sting has gone out of Hawthorn's game as some sloppy play starts to creep into their game. They must treat this game as if they are playing a top four side. BEHIND HAWKSThe ball spills into the hands of Lewis, who rolls the dice and has a kick at goal, but he rushed his kick as all that he could manage was a behind. We have just over five minutes of play left in the term, enough time for either team to kick a couple of unanswered goals. BEHIND HAWKSBreust marks 45m from goal on a slight angle, he kicks for goal and it is rushed through for a point for the Hawks. The Suns would love a couple of quick goals to bring them back into the contest. BEHIND HAWKSBreust marks inside 50, he takes the set shot on goal and is offline. GOAL SUNSMay marks 45m from goal with no relative angle to speak of, he comes in and kicks his second goal of the game as he fist pumps the air and yells out YES! A bit of a lull in play, where neither team have looked like they could score in the last few minutes. An update on Hodge Vs Ablett: Ablett still leads the way with 27 possessions and two goals against Hodge who has 23 possessions and two behinds. GOAL HAWKSEllis hangs behind the pack, the ball goes to him and he kicks a worm burner of a goal, to restore the margin back to 44 points. GOAL SUNSMay marks 50m from goal directly in front, he takes his time and kicks his first AFL career goal. The Hawks have upped the ante and are ready to take complete control of this contest. GOAL HAWKSShiels marks it 40m from goal directly in front, he slots it through with precision, as the Hawks get the margin out to 44 points. Smith is the recipient of a down the field free kick for a push in the back. He takes the kick from 30m out on the boundary and puts it out on the full. Great work by Coad, bursting through defence and taking the ball away from the danger zone. Shaun Burgoyne has now been moved up forward for the Hawks, as another option to kick to in attack. GOAL HAWKSYoung kicks it to the top of the goal square as Smith runs onto it, puts it onto his boot and kicks a great running goal. We are back for the second half and the Suns get first use of the ball. The Hawks go into the main break leading the way by 32 points over the Suns. GOAL HAWKSGunston marks in front of his opponent and he goes back from 25m out to kick his second goal of the day. In the other battle today, Ablett Vs Hodge, Ablett leads the way with 22 possessions and two goals and Hodge has 19 possessions and two behinds. BEHIND HAWKSGunston runs into space and marks 30m out, directly in front. It is an awful kick off the boot as he just sneaks it through for a point. We have only had three goals kicked between both teams this term, so it may end up being a short one. The Suns need to put some goals on the board, just to bring them back into the game before half time. As incredible as it sounds, the Hawks have had ten entries into their forward 50 this term with only a return of two goals. The Hawks go coast to coast and Savage takes the mark 45m from goal. He takes the set shot and puts it out on the full, hitting the behind post. BEHIND SUNSStanley goes for home from 60m and it is touched on the line for a point. BEHIND HAWKSHodges gathers it on the boundary, he decides to go for goal and misses away to the left. Hodge now has 16 disposals. GOAL HAWKSAblett makes a rare mistake, being tackled on the goal line by Puopolo. He is awarded a free kick, he snaps around the corner and goals. BEHIND HAWKSRoughead takes the handpass, kicks for goal from 60m out and misses. BEHIND HAWKSPuopolo takes the spill from the Schoenmakers contest, has a ping at goal and misses. GOAL HAWKSSavage gathers it 30m from goal, he kicks it along the ground and it bounces through. Savage has now kicked two goals. It is all about Gary Ablett at the moment, the Suns superstar is having a field day with 16 possessions and two goals. He continues at this rate and we will be checking the record books very shortly. GOAL SUNSBrennan flicks it off to Ablett, who looks up at goal from 45m out on the boundary, he threads the eye of the needle for a goal. Smith receives the free kick from the umpire after a holding the ball decision against the Suns. He has a shot at goal from 50m and he hooks it across the face of goal, putting it out on the full. We are back for the second term, as the Hawks get first use of the ball from the middle. The Hawks go into the first break holding an 18 point lead over the Suns. BEHIND HAWKSYoung takes the free kick from 75m out, after the siren, it falls short and it is punched through for a rushed behind. 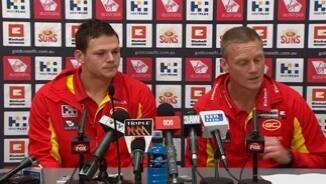 Have the Suns cloned Gary Ablett? He is everywhere at the moment, as he takes a mark across half back. GOAL HAWKSSmith takes it from the spill of the pack, slams it onto the boot and kicks a great rolling goal. The Hawks are out to a 17 point lead. BEHIND HAWKSHodge marks on the boundary 40m from goal, he comes in and attempts to swing it around but can only manage a point. Ablett has the ball on a string at the moment, with 10 possessions and a goal next to his name. BEHIND SUNSThe ball is thumped through for a rushed behind for the Suns. GOAL HAWKSGreat kick by Breust who finds Hale 20m from goal directly in front. Hale nails it and the Hawks lead by 11 points. GOAL HAWKSGunston comes out and takes the strong mark 35m from goal on a slight angle, he kicks it well for a goal and the Hawks take the lead. GOAL SUNSThe Suns takes it away from the middle, as Matera hands it off to Magin who finishes the job by kicking a goal on the run. GOAL HAWKSRoughead can't take the mark, but he gathers the ball gives it off to Schoenmakers who kicks a great goal around the body. GOAL HAWKSSavage picks up the loose ball, runs to 50, steadies and goals. The Hawks are not the same Hawthorn that have been pegged as premiership favourites at the moment, however that could change in a hurry. GOAL SUNSBrennan spots Ablett on the lead as he gets him 35m from goal in the pocket. He kicks wonderfully well as the Suns shine ahead by seven points. BEHIND SUNSShaw looks up at goal and goes for it, but can only manage a point. Ablett tells him that he was free if he would have looked around. GOAL SUNSBrown comes out and takes the mark 35m out on a 50 degree angle, he kicks it through for the Suns first goal of the game. BEHIND HAWKSBreust marks 40m from goal on a slight angle, he kicks it away to the left for a behind. The Hawks do what they do best and wear teams down to the ground, as they continue to chip the ball around the ground. GOAL HAWKSSchoenmakers comes out and takes the contested mark 30m from goal on a slight angle. He kicks truly and the posts the first goal of the game. If the Suns manage to upset the Hawks, it would be the biggest upset in AFL history. BEHIND SUNSBrown comes out and takes the mark 45m out near the boundary. He kicks for goal, it starts out left and it stays there. 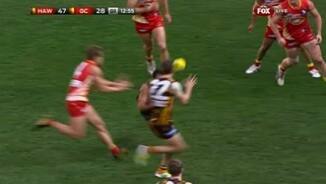 The ball comes down to the Roughead area but great work by Warnock to punch the ball away from him. The subs today are Bateman for Hawthorn and Toy for the Gold Coast. The ball is bounced in the middle and we are under way. Welcome to the MCG for the match between Hawthorn and Gold Coast. Both teams have late changes, with Franklin out for Hawthorn and Bateman comes in. The Suns lose Dixon and Coad replaces him.